Marilyn Monroe said it best, that diamonds are a girl’s best friend and the Tag Heuer Microtimer Diamonds timepiece is no exception. 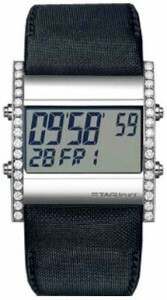 Sporty wear has met elegance in a dazzling array of diamonds set next to a digital display. But don’t let the glamour fool you. Tag Heuer’s Microtimer collection has won the 2002 the Grand Prix d’Horlogerie de Genève for both form and function. Take for example a clever second traditional chronograph time zone display for those who travel. The display may also be set to stand by mode or completely turned off for added convenience. Tag Heuer has developed the digital display with a precise reading of 1/1000th of a second for optimum performance. The 32 gorgeous 1.88 carat and 2.5 mm diameter diamonds are tastefully set inside the timepiece, which is also fitted with scratch-resistant, anti-reflection sapphire crystal. The tight seal makes the Microtimer Diamonds water-resistant to 100 meters or 330 feet. The case of the timepiece is made of stainless steel with a comfortable grey fabric wristband for flexibility, comfort and style. 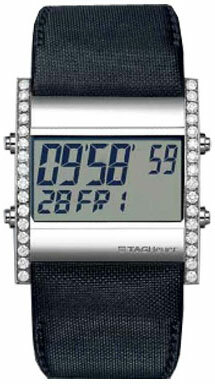 The Microtimer Diamonds is a limited edition that will be sold only for a short time.